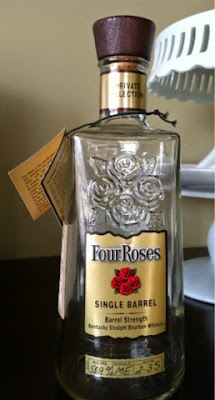 This is my first try of any of the Four Roses Private Selection recipes. I always see them on the shelves at my local Binny's, but just never got around to picking one up. I realized with my first sip what a mistake I was making! 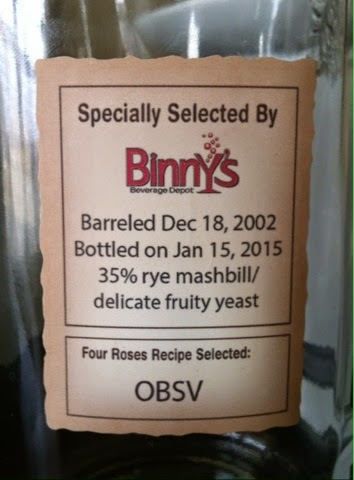 This particular bottling was aged 12 years and 1 month, and has a ABV of 58.9%. I've previously reviewed the regular Four Roses Single Barrel, so I at least had some point of reference when tasting this. Ultimately, though, it didn't matter, as this was one of the better bourbons I've had in a while, one where I was truly sad when I got to the bottom of the bottle. Because it's barrel strength, I expected a high burn (as I got from the regular Single Barrel). I'm not sure what would have caused the difference, but there was surprisingly little burn to this one. It's still high proof, no question about it. It just didn't have the burn that I expected. The flavor up front, though was light and sweet, reminding me of a mix of pear and vanilla. It was incredibly flavorful and tasty from the start. At the back end it added a distinct flavor of chocolate-orange - just like the chocolate oranges that you can buy from the store. That had me wanting to take my next sip right away! As the bottle sat open for a bit, the pear/apple flavors remained, but it took on an added salted caramel flavor that only made it better. Because it's high proof, I found this bourbon to be very warming, which was complemented by the high rye content (a personal preference of mine). The light fruitiness mixed with the heavy rye provided great balance. I know each barrel is going to have different characteristics, but I loved this particular recipe, and, if it weren't for the fact that there are 9 more that I want to try, I'd go back for this one in a heartbeat.